All over America sick and twisted people are dressing up like creepy clowns in order to frighten the living daylights out of others. This trend started back in August, and since then social media has helped it spread like wildfire. So far there have been creepy clown sightings in 11 different states, and Mississippi and Kentucky have been added to the list since my last article. A lot of young kids seem to think that this is a great idea for a “prank”, but authorities are taking the creepy clown phenomenon very, very seriously because in recent days the threats of violence have become much more chilling. Individuals posing as “creepy clowns” on social media are openly naming specific schools that they plan to target and are threatening to commit horrific acts of violence. That may sound like an interesting plot for a Hollywood horror movie, but in real life these kinds of threats have very serious consequences. 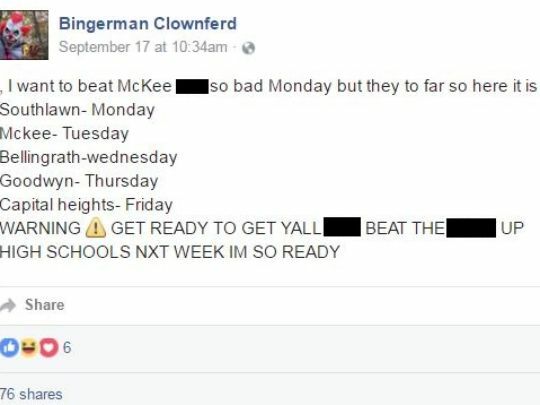 A number of Alabama schools were on lockdown on Monday after a series of Facebook posts from users posing as clowns threatened local children with violence. Posts on the group ‘Flomo Klown’ warned that clowns may show up at two schools in the Birmingham area and one student alerted local police. Fortunately, authorities were able to identify the people that were making those threats. The police discovered that two juveniles and one adult were involved, and so far one arrest has been made in the case. The posts include vulgar language and threats of violence and began the day after Flomaton Police Department arrested two juveniles and an adult for a similar threat that caused a soft lockdown at Flomaton schools. “I’m the southlawn clown I saw all of you all today at school I watched y’all walk home ik who y’all are if I don’t get u tonight it will be monday (sic),” Clownferd posted on Sept. 16. As I stated above, law enforcement authorities are taking these threats very seriously. And considering the terror attacks that we just witnessed in New York, New Jersey and Minnesota, they would be foolish not to do so. Extra deputies patrolled Saks Middle School in Calhoun County after someone threatened on Facebook to start shooting at the school. A 16-year-old Pleasant Valley resident was arrested and charged with terrorist threats. Since the suspect is a minor, their name was a not released. Calhoun County Chief Deputy Matthew Wade described the incident as troubling. In Etowah County, a social media post hinting about a clown visit at Rainbow Middle School and John Jones Elementary caught authorities attention on Sunday. Police presence was increased at the schools on Monday and a Gadsden City High School freshman was questioned by Rainbow City Police about the matter. Chief Jonathon Horton said the department is collaborating with juvenile probation and the Gadsden City School system to figure out how to move forward in the case. No “prank” should ever involve threats of violence. Many young people don’t realize this, but anonymous threats of violence can actually get you charged under terrorism laws. So you may think that what you are doing is quite funny, but it could end up landing you behind bars for an extended period of time. In Brighton, a suspect dressed as a clown jumped out of the bushes and chased two teens down the street on Sunday. The incident happened at 8 p.m. on Huntsville Avenue near King Street. Authorities said the suspect fled in a white van similar to a Chevrolet Astro Van. Brighton police Chief Ray Hubbart said the children and their parents are still a little terrified. Since the investigation is ongoing, anyone with information is asked to call Brighton police at 205-425-8934. In another incident, on Monday night an 18-year-old was arrested in West Blocton after jumping in front of a car while wearing a clown mask,according to WBRC. 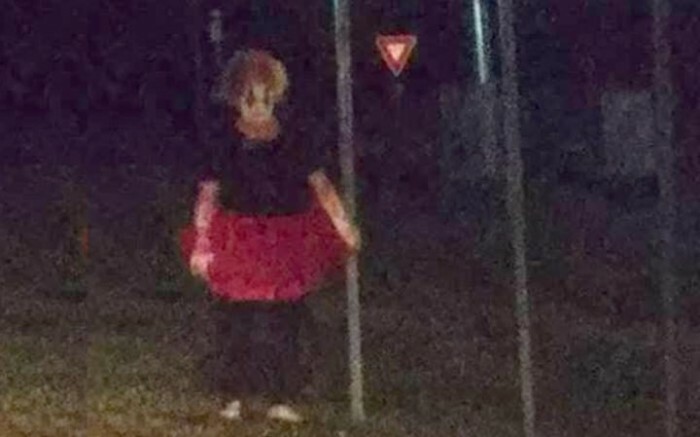 The first incident involved a “creepy clown” chasing a couple of kids from a store parking lot back to their home, reports show. “According to the complainant, a person dressed as a creepy clown and wielding what appeared to be a knife, allegedly chased her 17-year-old daughter and 11-year-old niece from the lot of the Mapco convenience store back to their Fernwood Drive apartment,” officer Mitchell Moore said. Was it just a prank, or did that “creepy clown” actually intend to do harm to those children? Fortunately we did not find out, and it was probably just someone trying to pull a “prank”, but if authorities would have caught up with this individual they would have thrown him in jail. So, I was a little scared to post this because I didn’t think anyone would believe me until Kelly Hill told me that one of her friends just had seen a clown here in London. Amy Gunter And I was out tonight & was headed back home on 192 & saw this. Now, it’s not a really good picture because I couldn’t stop, there was people behind me. I seriously think this clown thing has gotten out of hand & someone is going to get hurt. Please share this so people around London will know that they are here! As I stated in my previous article, dressing up as a “creepy clown” is a quick and easy way for unbalanced individuals to get media attention, and so we are likely to see this trend continue to intensify. And of course Halloween is quickly approaching, and creepy clown costumes are always popular this time of the year. But this has long since stopped being funny. The threats of violence are becoming increasingly disturbing, and it is only a matter of time before someone goes too far and people start getting seriously hurt. So let us hope that this “trend” fades away soon and people start moving on to other things.